• Ford's Gin - Simon's namesake gin was produced in collaboration with the distiller at Thames Distillers in London. In the botanical mix besides juniper are corriander, bitter orange peel, lemon peel, grapefruit peel, jasmine flowers, orris, angelica, and cassia, and their website in a brave degree of honesty actually lists the percentages of each botanical by weight in the infusion. On the nose, the gin reminded me a lot of Bombay Sapphire, No. 3, and Nolet's gin due to angelica or orris in conjunction with the juniper. At first the gin was rather earthy and low in citrus when tasted neat; however, after adding a splash of water to this 90 proof spirit, grapefruit peel and cinnamon suddenly became quite apparent. • Aylesbury Duck Vodka - This spirit is made from white winter wheat grown on small farms in western Canada and is distilled to 193 proof before being diluted for bottling at 80 proof. Yes, it was vodka, but it was not absolutely flavorless and I enjoyed the light grain notes when tasted neat similar to that in Russian Standard. A few did not enjoy that like I did, but the biggest complaint was a glycerol sweetness and body aspect to it. Compared to a pot stilled spirit, it was slight and I did not really have a problem with this. 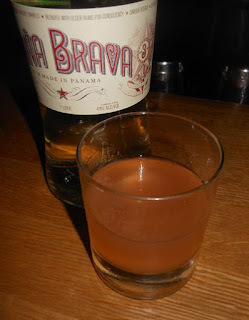 • Caña Brava Rum - The rum was made in conjunction with Panamanian distiller Francisco "Don Pancho" Fernandez who is also the maker of Ron de Jeremy. The 86 Co. sought him out for his experiences of making rum in Cuba before Castro and they wanted to make a Cuban-style white rum that would be perfect for Daiquiris. The end result is a rum made from wild sugar cane grown on volcanic soil in Panama, aged up to three years in wood, blended, and stripped clean of color through charcoal filtration. I was hoping for something grassy like I had heard old Cuban rums were, but instead the sugar cane notes were more subtle in this smooth and clean white rum. The vanilla notes from the barrel aging were there but not as robust as say El Dorado 3 Year. Bottled at 86 proof. • Tequila Cabeza - For all that I found the rum to be on the subtle end of things, the tequila was quite the opposite. The spirit was produced in the Los Altos region of Jalisco, and the Vivanco family opted for cooler, slower winter fermentation to bring forth this extra flavorful style. I enjoyed the spirit for it had more vegetal and fruity notes to it as opposed to many of the tequilas that are on the market. Also bottled at 86 proof. Besides the tasting at the Hawthorne, bartenders Katie Emmerson and Nicole Lebedevitch were mixing up cocktails with the gin. Before the tasting, Jackson Cannon offered me a gin and tonic which was good but hid the gin a bit too much to make a decent call. For a cocktail later, I chose a Martinez and the gin worked well to add extra spice and citrus notes to the mix. I think the gin will appeal the No. 3 and Nolet's crowd more so than the Beefeater or Plymouth set. After the Hawthorne, we loaded up onto the party bus and traveled to Fort Point to have punch and cocktails made by the Drink crew. The Don's Mix-laden Daiquiri of sorts that I tried was crafted by Josey Packard; perhaps it was closer to a Donga Punch. The cinnamon on the nose led into a sweet grapefruit sip. Next, the swallow offered rum, cinnamon, and spice.